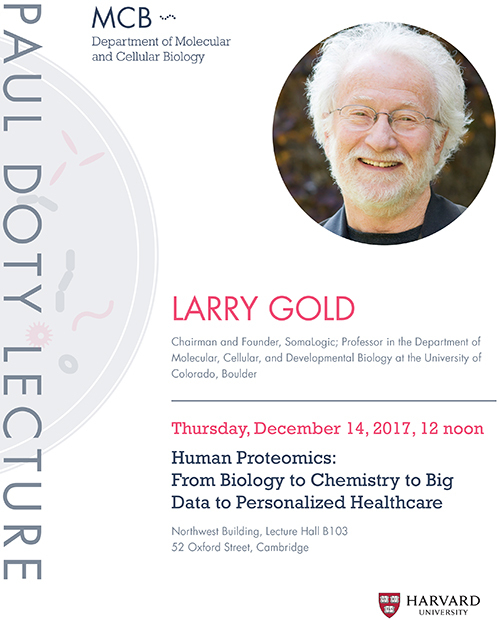 Larry Gold will present the annual Doty Lecture, “Human Proteomics: From Biology to Chemistry to Big Data to Personalized Healthcare”, at 12 noon on December 14, 2017 in room B-103 of the Northwest Building. The Doty Lecture celebrates the scientific and public policy achievements of Paul Doty, who founded both the Molecular and Cellular Biology department (then the Department of Biochemistry and Molecular Biology) and the Belfer Center for Science and International Affairs at Harvard. Dr. Gold is the founder and chairman of Somalogic, and a professor in the Department of Molecular, Cellular, and Developmental Biology at the University of Colorado, Boulder. He and his laboratory originally worked on fundamental mechanisms of gene regulation in bacteriophage T4 and the bacterium E. coli. In 1989 he and his student Craig Tuerk invented SELEX, a combinatorial technique for selecting synthetic RNA molecules, called aptamers, that can bind like antibodies to essentially any chosen target. His research interests turned toward applications of SELEX and RNA aptamers in human health, and one of the companies that he founded developed the first clinically approved RNA aptamer drug. His current work aims to use modern biotechnology to improve personalized health care. Gold grew up in Schenectady, New York. He graduated from Yale in 1963, received his PhD from the University of Connecticut in 1967, and worked with the biochemist Fritz Lipmann at Rockefeller and in the famed Geneva molecular biology group before taking a faculty position at MCDB in Boulder in 1970, where he has stayed, serving as the department’s chairman from 1988-1992. The building is now named Gold Biosciences in his honor. 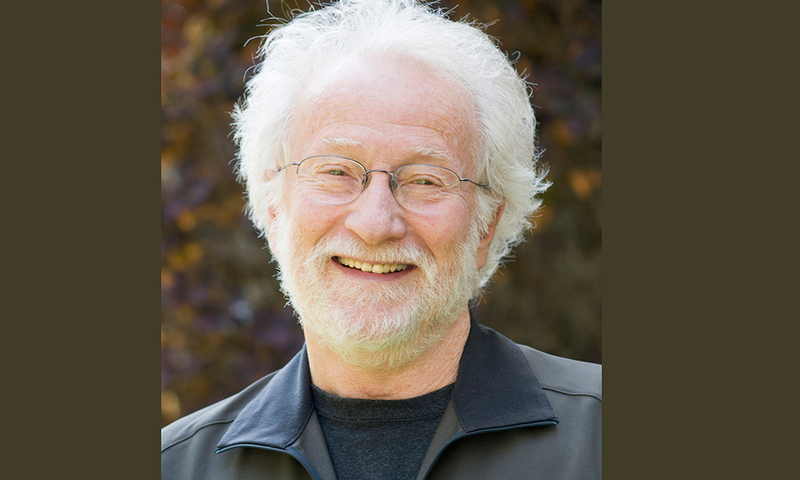 A leader and entrepreneur in the Colorado biotechnology community, he co-founded Synergen in 1981, founded NeXagen in 1992, and founded Somalogic in 1999. In addition to his academic publications he has over 100 patents in his name, and with Craig Tuerk was named an “Inventor of the Year” by the European Patent Office. He has been elected to the American Academy of Arts and Sciences and to the National Academy of Sciences. His Gold Lab Foundation hosts an annual symposium in Boulder that unites an eclectic range of creative thinkers, including scientists, artists, writers, and public servants. Paul Doty was the Mallinckrodt Professor of Biochemistry Emeritus and also Director, Emeritus, of the Belfer Center for Science and International Affairs, which he founded at the John F. Kennedy School of Government in 1974. As a biochemist, Doty elucidated the structure and function of large molecules, ranging from the polymers in plastics and fibers, to polypeptides and polynucleotides. He is perhaps best known for demonstrating the denaturation of the double-stranded DNA molecule and its reuniting through hybridization, a technique that helped open the era of recombinant DNA research. As an advocate for arms control, Doty led and participated in many initiatives to bring Russian and American scientists together in pursuit of international security, making more than 40 trips to the Soviet Union. He was a member of the President’s Science Advisory Committee (PSAC) during the Kennedy Administration. After retirement, he continued his work in this area, including serving as a board member of the Soros International Science Foundation that provided critical research support to Russian scientists in the 1990s. He passed away on December 5, 2011.